I always wonder what to do with these new packaging materials. They use to use those Styrofoam peanuts that as soon as you touched them they stuck to you. You would start waving your hand and one would fall off and another would attach itself. They were almost impossible to get rid of. Then they went to the biodegradable ones that melted when they got wet. Really cool the first time you play with them but not a great thing to wash down the sink, or if your package got left on the front stoop you would have a real mess on your hands. So the new thing is to send the little bags of air that you use to protect your purchases. 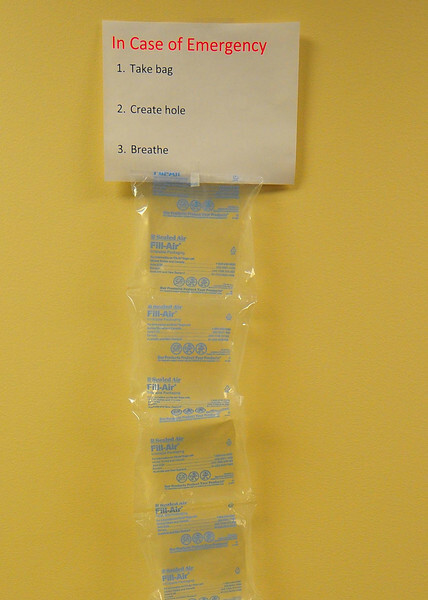 Here's what I use them for.....right on the wall outside my office.